Valley Transit is a full-service bus company serving South Central Texas and Northern Mexico with intercity, charter, tour and transit operations and Package Express service. Fares, schedules and tickets available through Greyhound.com. To or from the Harlingen International Airport, Brownsville International Airport or the McAllen Miller Airport to any city in the Rio Grande Valley. Reserve now. 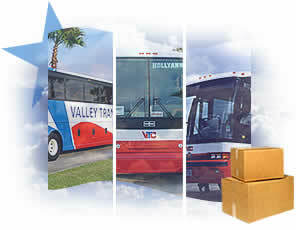 Valley Transit has openings for coach drivers and mechanics. Find out more.